“Action adventure icon” Mack Bolan is about to become an American Executioner in Paris (Los Angeles Times). Using the sniper skills he sharpened in the jungles of Southeast Asia, Mack Bolan has waged a personal war against organized crime. Cleaning up the states came first. Now he’s going international. While staking out Mafia activity at the Washington Dulles airport, Bolan is caught in an ambush by syndicate guards. As a cordon of police close in on the most wanted man in America, Bolan is forced to fly or die. Escaping on an airliner bound for the City of Lights, Bolan meets a man who could be his mirror image. So much so, that the double is mistakenly kidnapped by the mob as he steps off the plane. To rescue this unsuspecting innocent, the Executioner is going to bring the Paris underworld to its knees. He may not speak French, but he’s fluent in the universal language of a .32. 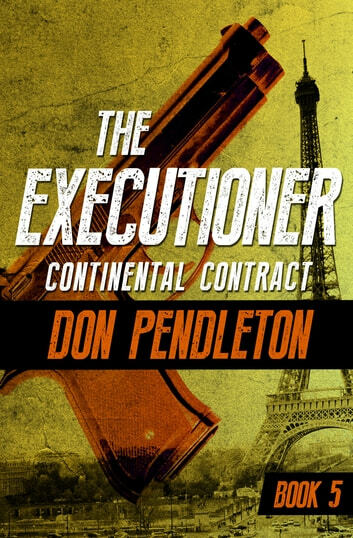 With more than two hundred millions copies of the Executioner books sold to date, author Don Pendleton didn’t just create a cultural phenomenon, he “spawned a genre” that still impacts artists today (The New York Times). Acknowledged by Gerry Conway as “[the] inspiration” for the Marvel Comics avenger, The Punisher, Mack Bolan remains “just as powerful in the world of publishing as he is in the dark alleys of any crime-infested urban hell” (NYBooktime). Currently in development as a major motion picture, the classic Executioner books pack a punch unequalled in the field of action-series adventure. Continental Contract is the 5th book in the Executioner series, but you may enjoy reading the series in any order.